I wrote this post, "I am nursing a 3-year-old," last year for Code Name: Mama's Joys of Breastfeeding Past Infancy. A year later and a couple weeks past Mikko's fourth birthday, I'm republishing it here to say that it's still true. Three years ago today, Sam and I were coming to terms with the new person in our lives. Three years ago today, we were eating hospital food and trying to catch some sleep after two full days in labor. Three years ago today, I was just beginning to breastfeed and was in the midst of receiving terrible advice about it. 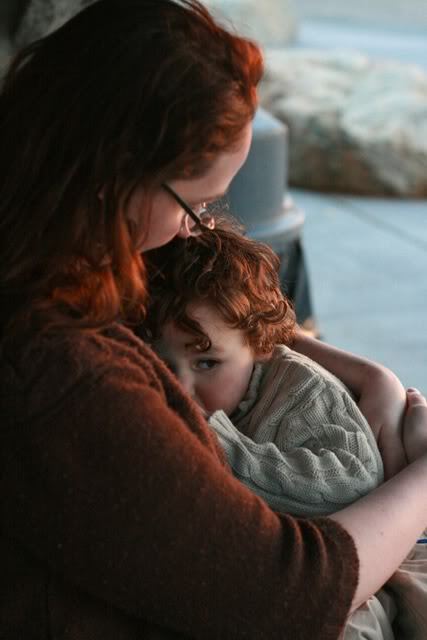 Three years ago today, I knew I was open to breastfeeding for a long time, but I didn't know how long. I didn't see anything wrong with it, but nursing toddlers did look big to me, compared with my newborn. I imagined I'd probably be nursing still at 2 years old, but 3 seemed a little far out. But you breastfeed day by day, not a year's leap at a time. Nursing Mikko today, at 3 years old, is different from breastfeeding him at 2 years old by only one day, one moment. He didn't become a gangly toddler overnight, so I had plenty of gradual time to adjust my vision of what a nursling looks like, each day. When Mikko turned 1, we mutually chose to continue, even though that first birthday put us past the magical 12-month mark. Turning 2 wasn't all that different from turning 1. He still wanted to nurse, and I had no objection. Will Mikko still be nursing next year, at 4? There is a part of me that still feels a twinge of unease about that, but I know if the time comes, and he is 3 and 364 days, it will not be any different to continue nursing him when he is 4 on the dot. We adjust our expectations, and our prejudices, and those big kids who look so huge suddenly shrink in size when it's our little baby who has reached that age. Today at Mikko's party, there were two women there nursing their newborns. I was proud to be among them still, planting a seed that even though my toddler must look gargantuan to their newborn-attuned eyes right now, maybe as those babies gradually get bigger, the mothers will keep responding to their growing babies' need to nurse. Maybe they won't feel bad about responding, or awkward in their social circle, because they know that I'll understand: Nursing toddlers don't become nursing toddlers overnight. They start as a baby, and they grow, right under your heart. My husband thought nursing a toddler seemed too long when we started, but with Sasha nearing the 2 year mark... neither of us can even imagine her not nursing! She nurses often. It is what works for her, for us. And good for you, for doing what is right for you & yours. Oh, and last night my father informed me that I could not nurse Sasha and a new baby. Um, wrong. I said I know lots of people that do it. He said the little baby would starve. Whatever dad. He is an expert on everything so there is no point arguing. @Momma Jorje: Ha! Your dad sounds a lot like my FIL… You can let him know that, despite Mikko's nursing, our baby is up from 8.5 to 11 pounds at 4 weeks and is getting nice and chunky. :) So glad things are still going well with you and Sasha! I wish you the best in pregnancy and potential tandeming. First off, congrats on sticking with what feels right for you and your son. What you're doing is not the norm in an industrialized society, even though it IS natural for human beings in all space and time. Secondly, I can very much relate to what you say about breastfed babies growing into breastfed toddlers slowly over time. Before I educated myself about breastfeeding, I thought I'd wean once teeth showed up (ignorant, right?). I have revised that goal to 2 years. Now that my son is 18 months, I am beginning to wonder if 2 years is too short for us. At this point, I figure I'll just wait and let breastfeeding go on as long as it works for us. Now, I can easily imagine nursing a 4 year old. This is so beautiful. Truly. I never thought about the slow transition into older child. That makes so much sense. Now that I have my daughter, I can see where I would have kept going with her too, if I'd been able. Wonderful! Great post!You have courage. My son is 4 years and 7 month and he is still breastfeed! That's so sweet! I have breastfed my toddler right up until my 5th month pregnancy (my boy was 25 months old then) as my BM dwindled down to nothing due to the hormones. But I'm glad that he's still dry nursing from me as I really hope we can make it to tandem nursing! Btw, I'm at my 29 weeks now. Hi Lauren, thank you for this post, and thanks for reposting it. I also never thought I'd nurse this long. L is now 4 years and 8 months old and he is still nursing at home on the sofa when we cuddle and to fall sleep every night. He doesn't seem to part with it, we have conversations about it, and I also have a hard time to cut something off that is so beneficial for both of us. Plus I really still love doing it and he will be my only child. You said it best: "Nursing toddlers don't become nursing toddlers overnight. They start as a baby, and they grow, right under your heart." That was lovely! I'm a new follower with GFC. I really loved this post! My baby nursling is 4 weeks old...4 years seems so far away sometimes! Congrats to you. I laughed at myself recently, because I suddenly realised that I became that momma that I eyed with surprise when my baby was a newborn... she had all of her kids around her (she home schools) and was nursing her 2 year old. He seemed so BIG. Now, I am that home schooling momma, nursing an almost 2 year old, and it doesn't seem extraordinary at all. I want to extend a big THANK YOU to all of the EB mothers I have come in contact with over the years... their example has subconsciously helped me in my journey towards the same. thanks for sharing; I am still nursing my two year old with no plans to stop, though feel in a tiny minority right now, so to connect with other nursing mums who nurse past infancy is really valuable and necessary.